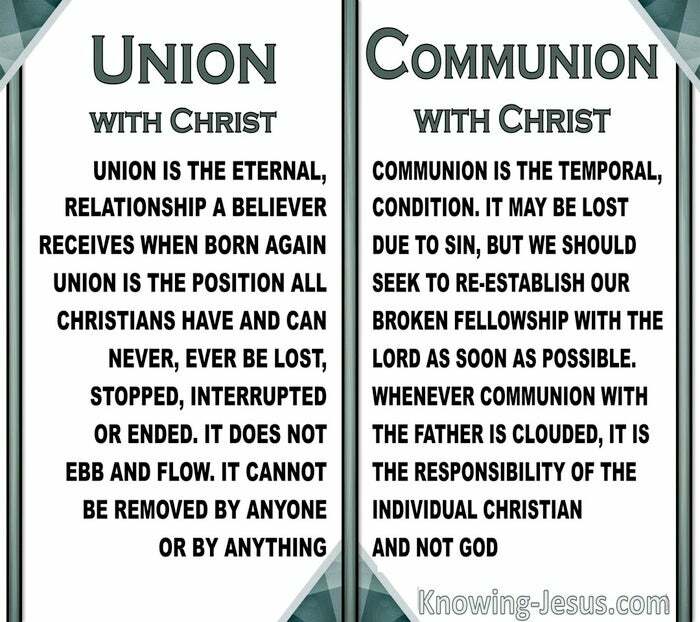 Many Christians desire union and communion (or fellowship) with our Lord Jesus, but feel they do not enjoy it as they desire. Many believers confuse union with communion thinking they are the same thing, but they are not. Union with Christ can never ever be stopped, interrupted or ended, while fellowship is a temporal relationship with God, that may be lost or left, but should be eagerly pursued. Unsaved humanity can be united with Christ through faith. Those who believe on Jesus for salvation are saved, and brought into union with Him by the power of the Holy Spirit. Union with Christ is the condition of all Christians. It is a permanent state, an everlasting union that does not ebb and flow, nor can it ever be lost or left. It cannot fluctuate or be removed by anyone or by anything. Communion is distinct from union and only born-again believers who are walking in the spirit, can commune with the Father. Clothed in Christ’s righteousness the believer is accepted in the Beloved and can fellowship with God. But the outflow of communion can wax and wane, as our love for our Saviour fluctuates with our feelings or grows weary of well-doing. Communion can also be broken due to sin. 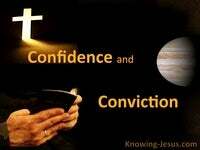 But whenever communion with the Father is clouded, it is the responsibility of the individual Christian, and not God. Fellowship with the Lord should be the experience of all believers as we grow in grace and submit to the Spirit’s work in our lives, as He seeks to conform us into the likeness of Christ, but this is not always the case. Fellowship is broken when a Christian prevents the work of the Holy Spirit in their life, for we can both grieve Him and quench His work in our lives through sin, but how few really understand what sin is. Sin comes in many guises and disguises, and how we love to hide or ignore it. 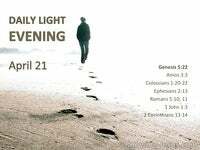 We can sin overtly or we can try to cover up our sin. We can sin with our mental attitude, where sin is carried out in the mind and we can sin motivationally – where a good deed is done for the wrong reason. It is very simple to sin, and very easy to pretend that we are not sinning, but God looks on the heart, even if we try to deceive others. So sin grieves and quenches the work of the Spirit within the believer, and sin blocks communion and fellowship with God, and with the Lord Jesus Christ. But many of us do not have a right understanding of what sin is. Sin is what God hates, for God is holy and commands His children to be holy, and yes.. scripture gives the answer, as we see in Proverbs 6:16. These six things doth the Lord hate: yea, seven are an abomination unto Him. (1) A proud look; (2) A lying tongue; (3) Hands that shed innocent blood; (4) A heart that deviseth wicked imaginations; (5) Feet that are swift to run to mischief; (6) A false witness that speaketh lies; (6) He that soweth discord among brethren. Some are overt and some are covert sins, and some are motivational sins, but all are connected with a mental attitude. Blood may not be dripping from the end of a knife of hatred, bitterness, envy, unforgiveness, or pride.. but our thoughts and attitudes may commit murder and destroy fellowship with our Lord. How we need to examine ourselves to see if we are in fellowship, and if not we need to confess our sins, and God is faithful and just to forgive us our sins and restore us to fellowship. 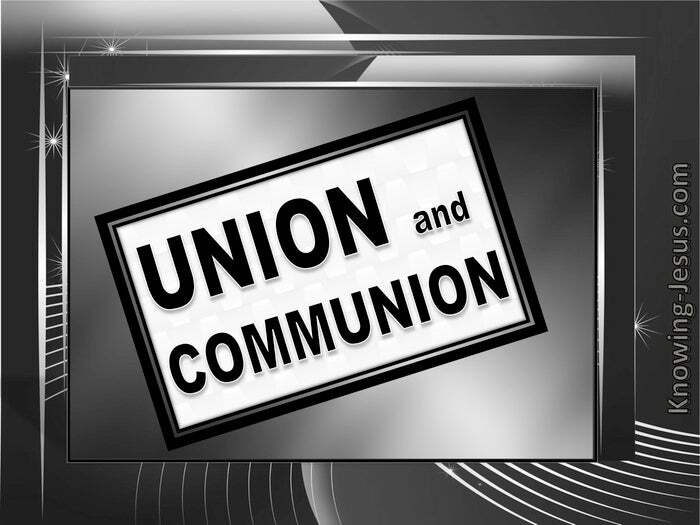 Union and communion are not the same thing. Union is the eternal relationship a believer receives when born again, and union can never ever be stopped, interrupted or ended. Fellowship however can be broken. Communion is a temporal relationship and may be lost due to sin, but we should seek to reestablish our broken fellowship with the Lord as soon as possible. But remember, our union is an eternal relationship that can never, ever be stopped, interrupted or ended – for ever and ever. Amen.